When it comes to side dishes for weeknight dinners, I feel like I deserve a C-. It’s sort of reminiscent of my freshman microeconomics grade whereas I do put quite a bit of effort into the work in spite of the fact that I just don’t get it. And yes, my micro- grade was a C-, not a great way to start off a college career. In any event, I do plan side dishes for all of my meals, buy the ingredients when necessary, but I have such a hard time pulling the trigger to get them prepared. Usually there are pans flying around my kitchen, a cookbook stacked on top of the coffee pot since space is so limited, and maybe a few choice words shouted at the burner that will never stay hot enough (thank you glass-top stove) when I’m cooking dinner. It’s not a pretty scene so last week when I had some leftover butternut squash from the curried butternut soup that I made, I decided to use it up right away rather than stashing it in the fridge for another time that may never arrive. I’d like to say that I put more effort into this pureé other than boiling the squash in a sauce pan until tender but I’d be lying. Actually, photographing the squash took longer than it did for me to prepare it once it was cooked. 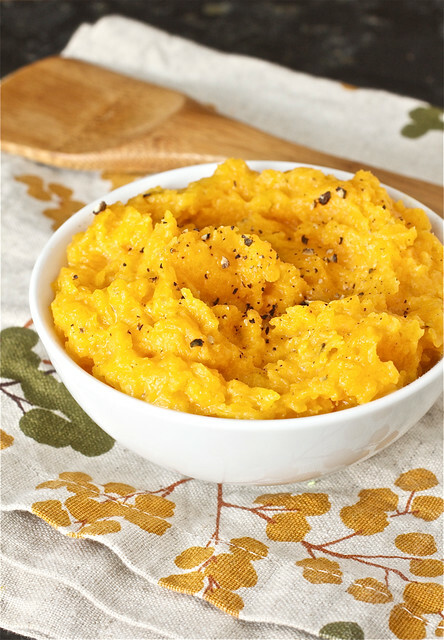 I drained the squash, added a few staple ingredients, mashed it, and it was ready – ridiculously simple, really. I love a hefty amount of freshly cracked pepper in butternut squash when it’s prepared this way, something I never lost since childhood (what kid loads up their food with pepper? ), but if it doesn’t suit your tastes, cut back on it. The way I prepared the squash here is my favorite version however, you can definitely play around with some warm spices of fall – cinnamon, cumin, curry powder – and easily make this side dish your own. And if you want to cheat and buy the squash pre-cut from the grocery store, go for it – I did and it cut down on the painful prep of peeling a slippery squash. It’s tough to turn my back on side dish that take 15 inactive minutes to make and I don’t think any busy person on a weeknight would either. Add enough ground pepper to your satisfy your taste. I like a lot of pepper in butternut squash when it is prepared this way and I add about 3-4 cranks from the pepper mill; you may enjoy more or less so taste it as you season. In a 3qt sauce pan, add butternut squash pieces. Cover squash with enough water so that the water level is about 1 inch above the top of the squash. Over medium-high heat, boil squash for 12-15 minutes or until squash is cooked through when tested with a fork. Drain squash and return it to the hot sauce pan. Add butter, heavy cream, salt and pepper. Mash the squash to combine ingredients until the butter is melted through. Serve hot. I love adding a bit of squash or carrot puree to cookies or muffins. A great way to sneak in some vitamins and minerals! Sounds great, I love butternut squash! I totally know what you mean about failing on side dishes- we kinda alternate between potatoes and green beans… if we have them. This looks delicious and just as simple! Mmmm, I love butternut squash. My dinner prep sounds a bit like yours! Crazy good times. What a simple but wonderful way to find another use for the never-ending squash! thanks. i rarely ever have sides except a salad! this looks great. This looks yummy! I like it sweet. Any ideas there? You can add some brown sugar or pure maple syrup – I’m sure either would be fantastic!